Know what's worse than a horrible movie? A mediocre one, and Delivery Man is about as bland as it gets. It's a remake of Starbuck, a 2011 Canadian film that looks about as schmaltzy as it gets. 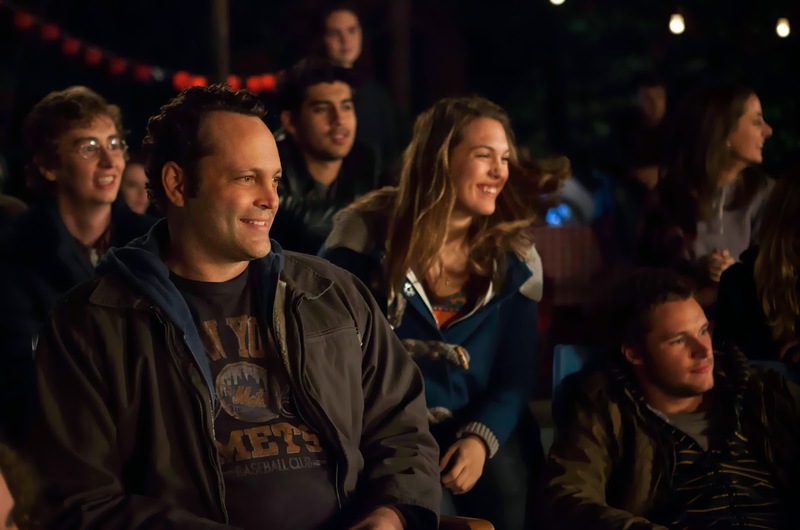 Delivery Man stars a very miscast Vince Vaughn as David Wozniak, a delivery driver for his family's Brooklyn butcher shop with a considerable number of crises coming to a head. He's deep in debt to the wrong kind of people. His cop girlfriend Emma (Cobie Smulders) is pregnant. But topping the list of predicaments is that, through some kind of mix-up at a sperm bank he donated to a couple of decades ago, he has fathered 533 children. And 142 of them are suing to find out his identity. Vaughn, who does just fine playing motormouth sidekicks and roguish jokers, seems straitjacketed here by the treacly story. It's hard to buy that Vaughn's self-centered Wozniak would launch this contrived campaign to get to know his biological children, one which involves performing random acts of kindness that benefit each of them. It's even more difficult to believe that through these interactions, Wozniak learns responsibility, like when he saves one of his daughters from OD'ing on heroin and throws away all of the pot plants he grows the following morning. While it's not unpleasing to see Vaughn stretch in possibly his most dramatic part of the past decade, the novelty wears thin, especially given the preposterous material in this ostensible comedy. Delivery Man isn't completely worthless, but it's best reserved for a couple of hours you might need to kill. From subzero comedic material we move on to equally chilly climes with Frozen. Inspired by Hans Christian Andersen's fairy tale The Snow Queen, Frozen is not only the best Disney cartoon in decades; it's one of the finest movies of this very competitive year. It's a story of two sisters—warm, accessible Anna (Kristen Bell) and the literally frigid Queen Elsa (Idina Menzel)—looking for true love in all the wrong places. Lest you presume they're going to find it in the arms of some handsome prince or even the rugged Kristof (Jonathan Groff), one of the most rewarding aspects of the film is its conscious effort to upend this and other pre-conceptions one associates with the Disney Princess template. Put this together with the wonderfully catchy, funny songs written by Robert Lopez (The Book of Mormon) and wife Kristen Anderson-Lopez (Winnie the Pooh) and a hilarious supporting turn by Josh Gad as the living snowman Olaf and you've got the makings of a classic indeed. But when you also factor in the dreamy visuals of its wintry wonderland setting and maybe the most formally elegant Cinemascope compositions in a feature-length cartoon since Disney's 1959 apex, Sleeping Beauty, watching Frozen becomes something akin to a transcendental experience for fans of animated motion pictures. Frozen is my idea of a perfect film. See it sooner rather than later.